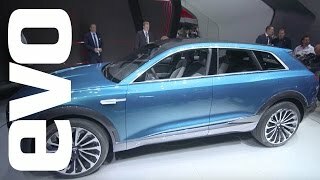 At the Frankfurt Motor Show 2015 Audi unveiled its new member in the e-Tron family, the Audi e Tron Quattro Concept 2015. No doubts to the fact that in past some time fully electric cars have been ruling the automotive market and in such a state to compete with companies like Tesla and Nissan, let us see what Audi has under its badge. Let us begin the study with this descriptive review of Audi e Tron Quattro Concept 2015. The interior of Audi e Tron Quattro Concept 2015 is simply amazing. The cabin looks like any glass house offering three massive displays featuring all the vital information that the driver might need. The displays and the tech features aren’t just about the information but they also look after the entertainment while you are on your ride. You might not find enough hard buttons as for this company preferred offering the touch controls over those screens and this again makes it walk a lap ahead of other in its competition. However the flat bottom steering wheel brings some hard controls over it, giving you an undisturbed ride. Though just a concept as of now but the interior design of Audi e Tron Quattro Concept 2015 undoubtedly raises expectations from team Audi. The exterior of Audi e Tron Quattro Concept 2015 commendably gives a sneak into the future of Audi vehicles. Starting with the front fascia the newly designed grille sits proudly with horizontal bars that keep the design intact. The interesting amalgamation of engineering and design comes through t sloping roof that that comes covered in solar panels. For the lighting Audi used the organic LED for both head and taillights. Through this not only they are saving the power consumption but the integration also adds to the looks of the model. Not only this have had they also minimized the drag to save more power. Moving further in context to technology, the side mirrors get replaced by the exterior mounted cameras. 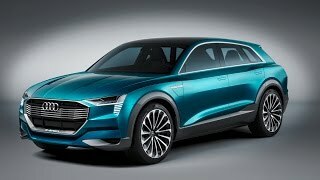 Rounding up the exterior details of Audi e Tron Quattro Concept 2015 I would say it is too good to come as a production version and if it does, the automotive industry will have a new milestone to achieve. 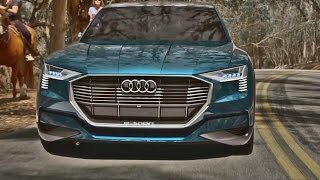 Powering the Audi e Tron Quattro Concept 2015 are three electric motors the crank the total output of 429 hp (469 hp while boosting) and peak torque of 800 nm. With this power rolling the vehicle, top speed of Audi e Tron Quattro Concept 2015 can touch the mark of 130.5 mph while the 0-62 mph sprint can be knocked in just 4.6 seconds.